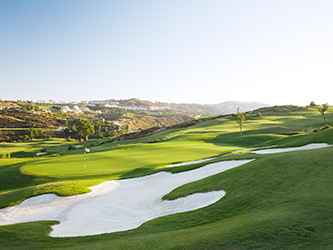 La Cala Golf, Campo Europa Course, the newest edition of the biggest golf complex in Spain. The Ojen river acts as water hazards on eight of the 18 holes as it winds its way across the course. The course is a dramatic and hilly course with narrow fairways. Your tee shot need to be accurate in order to keep away from the rough. Many holes are tough dog legs left and right. Erbjudande 8x7-1 spelare gratis för varje 8 spelare, gäller tom 31.12.14. Går ej att kombineras med golf amigos erbjudande. Kontakta vårt kontor för golfpaket på deras hotell Cala Golf & Spa.